There has long been a huge gap in the solar market, a gap between large, utility-scale solar projects and rooftop solar projects. It would be a disservice to numerous companies, organizations, citizen investors, and solar-supportive politicians to say that there has been nothing between those two installation types, but this middle space has long been high on potential and short on installations. As noted above, many people have worked hard to pioneer what is referred to as “community solar power” or “community solar gardens.” Still, a great portion of the population (some have estimated 75% of the US population) cannot go solar themselves because they live in an apartment or condo, don’t own their home, don’t have an adequate roof, have too much shading, or for other practical reasons. But they can go solar by investing in a community solar garden… if policy is in place to support that and someone is doing the work to make it happen. In such a system, the electricity is sent to the grid, the owners are compensated, and their electricity bills and usage are essentially offset by the solar power. There are a number of companies and organizations focused on this form of solar, but the challenge has been getting the policy in place to open up this market, and growing it to a truly considerable scale. I know many people who would love to invest in this type of solar, but simply don’t have the opportunity. Clean Energy Collective’s 144 kW Putney Community Solar Array, Putney, Vermont. Through the agreement, the two companies will jointly pursue opportunities in the community solar market to offer an affordable and convenient alternative to rooftop generation. As part of the deal, First Solar has made a strategic investment in CEC and obtained an equity interest, and First Solar’s CEO, Jim Hughes, and Vice President of Strategic Marketing, Marc van Gerven, will join the CEC board. Terms of the deal were not disclosed. The move is an integral part of First Solar’s distributed generation strategy, substantially strengthening the company’s entry as a solutions provider in the residential and business solar markets. 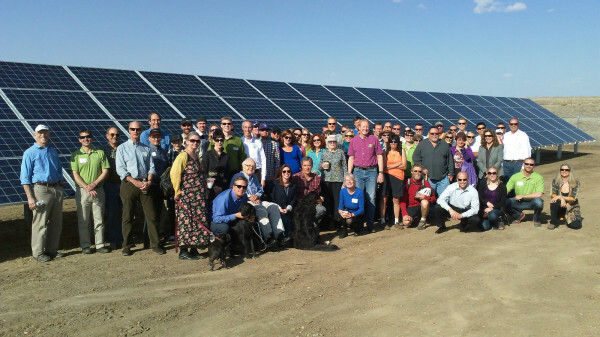 CEC, the nation’s leading community solar provider, pioneered the community solar model, through which a broad range of customers have access to solar energy regardless of the suitability of their rooftop or property ownership status. Through this relationship, CEC will accelerate the rollout of community solar generation aided by the efficient access to capital and innovative hardware solutions afforded by First Solar.